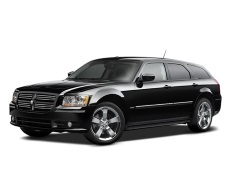 Correct Wheel Sizes, PCD, Offset, Rims and Tire specs for Dodge Magnum series. will this tire size fit my 2005 dodge magnum 245/60/18? Hi, ed,no,it can not fit for.Try235/60/18. Will Bridgestone tyranza. 245/50/18 Fit my 06 Dodge Magnum ? From 2006 to 2008 an SRT model was added with Brembo brakes...perhaps that will change fitment compared to the 5.7...what say you? Hi,Dwayne Hill,No,this tire is uncompatible for your car. Hi,Laxmr6,Yes,it can fit for your car. Hi,zachmont3,No,they have different wheel bolt pattern and offset.